Citation Information: J Clin Invest. 2007;117(12):3821-3832. https://doi.org/10.1172/JCI32301. The activation of interstitial fibroblasts to become α-SMA–positive myofibroblasts is an essential step in the evolution of chronic kidney fibrosis, as myofibroblasts are responsible for the production and deposition of the ECM components that are a hallmark of the disease. Here we describe a signaling pathway that leads to this activation. Tissue-type plasminogen activator (tPA) promoted TGF-β1–mediated α-SMA and type I collagen expression in rat kidney interstitial fibroblasts. This fibrogenic effect was independent of its protease activity but required its membrane receptor, the LDL receptor–related protein 1 (LRP-1). In rat kidney fibroblasts, tPA induced rapid LRP-1 tyrosine phosphorylation and enhanced β1 integrin recruitment by facilitating the LRP-1/β1 integrin complex formation. Blockade or knockdown of β1 integrin abolished type I collagen and α-SMA expression. Furthermore, inhibition of the integrin-linked kinase (ILK), a downstream effector of β1 integrin, or disruption of β1 integrin/ILK engagement, abrogated the tPA action, whereas ectopic expression of ILK mimicked tPA in promoting myofibroblast activation. In murine renal interstitium after obstructive injury, tPA and α-SMA colocalized with LRP-1, and tPA deficiency reduced LRP-1/β1 integrin interaction and myofibroblast activation. These findings show that tPA induces LRP-1 tyrosine phosphorylation, which in turn facilitates the LRP-1–mediated recruitment of β1 integrin and downstream ILK signaling, thereby leading to myofibroblast activation. This study implicates tPA as a fibrogenic cytokine that promotes the progression of kidney fibrosis. 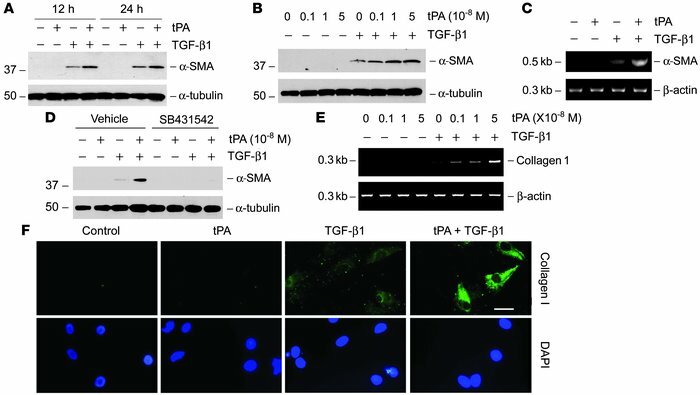 tPA promotes TGF-β1–mediated myofibroblast activation from renal interstitial fibroblasts. NRK-49F cells were treated with 10–8 M tPA and/or 0.5 ng/ml TGF-β1 for 24 hours, unless indicated otherwise. (A and B) Western blot analyses demonstrated that tPA synergistically promoted the TGF-β1–induced α-SMA expression in a time- (A) and dose-dependent manner (B) in NRK-49F cells. (C) RT-PCR shows that tPA promoted the α-SMA mRNA expression induced by TGF-β1. (D) Blockade of TGF-β signaling abolished the synergistic effect of tPA. NRK-49F cells were treated with 10–8 M tPA and/or 0.5 ng/ml TGF-β1 in the absence or presence of the TGF-β type I receptor inhibitor SB431542 (10 μM). (E) RT-PCR shows that tPA promoted the TGF-β1–mediated mRNA induction of type I collagen. (F) Immunofluorescence staining shows that tPA promoted TGF-β1–induced type I collagen expression in NRK-49F cells. Scale bar: 20 μm.